Give a bunch of people the same fried rice ingredients and I guarantee you, there will be a variety of cooking styles. Some people like to fry up each ingredient separately, some people like to scramble their eggs and some just like tossing the eggs right in with the rice. 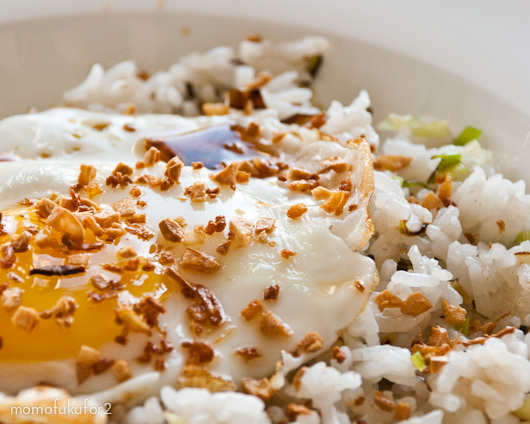 Jean-George tops his fried rice with a runny-yolk fried egg and in my books, runny yolks with rice is a good thing. Opposite to what the article claims, I don’t think this fried rice is any more finicky than a regular fried rice. 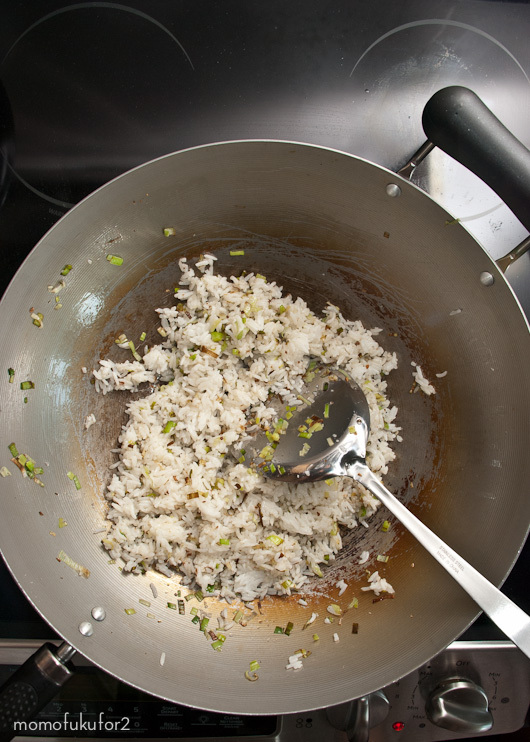 Yes, there are separate cooking processes, but I think fried rice is all about the separate cooking processes. I shouldn’t have worried about not liking this recipe. It was delicious. It had an almost meaty, umami taste to it. I loved the crispy ginger and garlic and with the runny egg mixed in it was divine. Mike on the other hand thought differently. Mike: Would you make it again? Me: I don’t know. It’s pretty good. Do you want me to make it again? Mike: Between this and the kimchi bacon fried rice, definitely kimchi bacon. Reduce heat under skillet to medium-low and add 2 tablespoons oil and leeks. Cook about 10 minutes, stirring occasionally. Season lightly with salt. 5. Divide rice among two dishes. Top each with an egg and drizzle with 1/2 teaspoon sesame oil and 1 teaspoon soy sauce. Sprinkle crisped garlic and ginger over everything and enjoy hot. and that is a great wok~ :3! 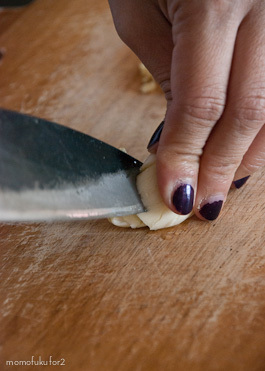 I Heart anything with ginger and this recipe really caught my eye! Love your posts and just wanted to say hi! You are making me want to get the Momofoku book too! 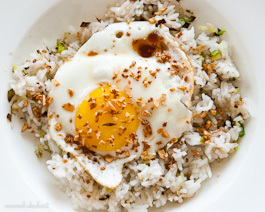 this is one of my favorite fried rice recipes! 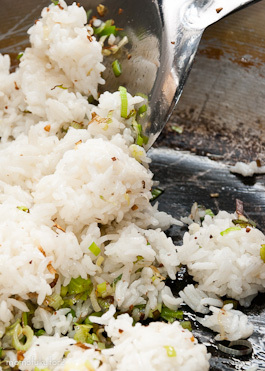 This has become one of our household favs… it’s the answer to all of those little boxes of white rice we had leftover from takeout! I actually found this recipe really underwhelming when I made it (around the time the article came out in the NY Times)…which was a shame considering it’s origins. ITS origins. Jeez. English major here. Embarrassing. 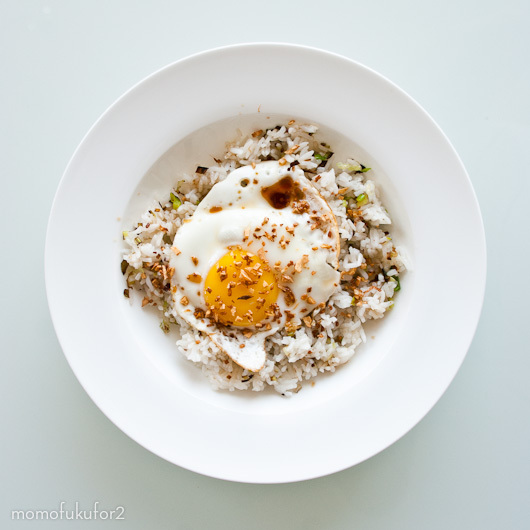 NEVER have I had fried rice with a fried egg on top…..the best part of an egg is the runny yolk, so obviously this dish of Jean-Georges makes perfect sense! This is now be my norm. Thanks! Nom, I only know about the Philippine Garlic rice with egg with some savory meat. I might try adding ginger and leeks the next time. I want this with fish sauce or fresh tomatoes in vinegar. I just made this tonight…it was yummmmmy! 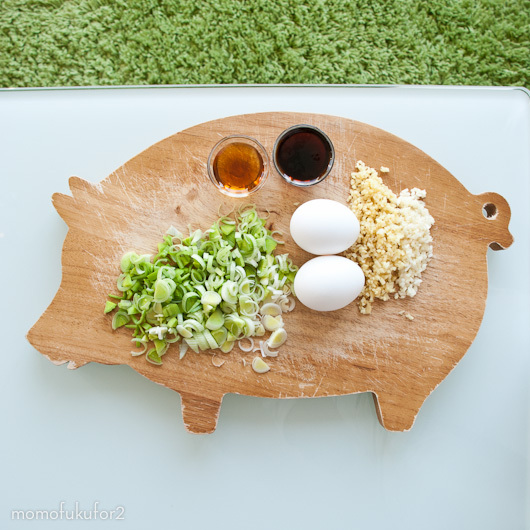 Thanks for posting your photos along with the recipe…cute cutting board too! from working at a Jean-George’s restaurant as a server I can personally say the rice is meant to be packed tight in a spoon and then the egg is served whole, but the server mixes it so the yolk runs through the rice and semi cooks from the heat. I don’t know in my world crispy garlic is burnt garlic which tastes bitter. I’d try it with crispy shallots, then adding ginger and make that all crispy, then add garlic and fry it for just a few minutes. This is quite interesting recipe. Where is you ‘kimchi bacon fried rice’ recipe? Ginger fried rice is my favorite thing to eat at Spice Market! You have to try it there! I tried to make it at home but I couldn’t make it as good as the one I tried in the restaurant! Yum! And I also just realised how cute that chopping board is!!! It’s a pig ahhh, I’m so in love with it!